You know your brand is in some sort of trouble when you get genius comics Like Dan and Dan writing brilliant skitts of what you do and tearing apart everything that your hateful, petty minded, bigoted brand stands for. Nice one Dan. And Dan. Love it. Bic is one of those brands that is easy to belittle or even ignore. As they are doing most of their work in the lower end of the markets they address, it is easy to overlook them as a real brand. It’s a shame they don’t own their own domain name, but at least the existing owners do offer a link to their site. But they are a real brand revolutionary. 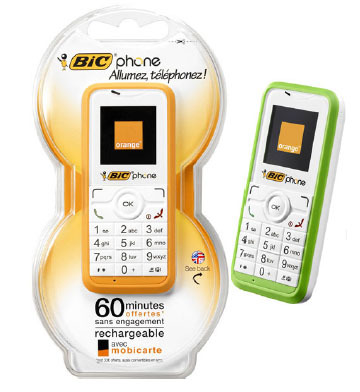 They have been delivering brand consistency since they formed in Clichy, France in 1945. But I’m going to put my reputation on the line and say that I think they are a quite remarkable brand and many others could learn from them and what they do. If I was going to summarise their brand values in a few words, I would describe them as Orange, practical, simple and functional. None of their products seem complicated, all seem to work very well for what they are and all offer tremendous value for what they do. They haven’t been chasing upmarket like others and as such, haven’t lost their way in the process. I was in Barcelona airport a few weeks ago and my eye was drawn to a Bic Phone. A bargain at 29 Euro and it came fully charged and with 12 Euro of credit on it. Even better was the fact that it was linked to the Orange Network! It looked like a good little phone and in an emergency (or an Ashley Cole) would be a good way out of trouble. 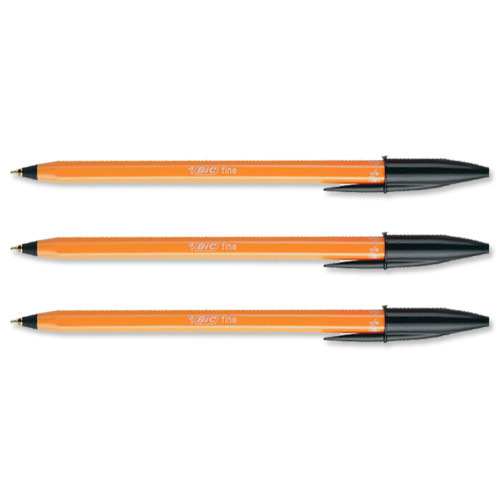 They still have their pens, but these are increasingly nice to use and don’t seem to be as orange as they once were. They also still do a great line in lighters. Looking at their history, these were introduced in 1973 and still seem to dominate most newsagents counters. Again, lots of new colours and styles have been introduced, but they are still a sensible, functional purchase that few could regret. And perhaps their most famous emergency purchase was introduced in 1975 (they were pretty productive years for the Bic design team!) 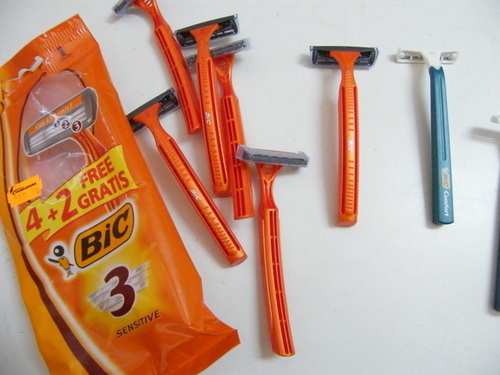 and is the Bic Razor. I was forced into using one the other day by having left my own in our holiday house, and it was actually okay. I was expecting to have my face lacerated like a dog had been gnawing at it, but it was a nick free shave. I know Bic won’t be everyone’s cup of tea as there is simply no Kudos in owning Bic, but as a brand man, I see an awful lot of bad brands out there and the Bic logo, the Bic product offering and the whole Bic brand ethos seems to have remained quite remarkably stable since they first started. I wish them many more successful years. One of my team just pointed me towards this as a new TED video and I have to say I was totally enraptured with it. The opportunities for this are absolutely endless. The biggest issue we ever have with any technology is the number of wires that come with it. On our recent holiday to Andorra, half my hand luggage seemed to be full of plugs, wires and different little gadgets. The technology itself is not that new, just this commercial interpretation of it. It was actually proposed by Nikola Tesla over 100 years ago! This has the potential to safely end all of this hassle or wired connections and the sooner we see it commercially, the better. ANy brand that can launch the wireless charging phone has to be onto a winner. The wireless TV would be fab (I already have a few wireless radios – but they still need to be plugged in to charge them! ), but trying to find wireless surround sound speakers that don’t need constant charging is something I have been looking for, for years. I read a great post from my friend Brian Cray earlier today about how sloppy designers are becoming in their thinking when it comes to design. It’s a great read and you can see it here. Later that very same day, someone took the whole article and cut and pasted it into his own blog, which again, you can see here. His thinking was soooo unoriginal, that he didn’t even bother changing the title. Yes he credited me for it, but does Google really know which is the original and which is the duplicated content that it will mark you down for in SEO terms? and here’s the uncredited copy by some Albanian shyster. I’m also a big fan of the work from the extraordinarily rude guys at COPY©UNTS. They have made it their business to uncover lazy ‘creative’ work where it has literally just been lifted from other peoples original thinking. And to top it all, I was sent an SEO proposal from one of my clients today and it read slightly awkwardly. I didn’t believe it was original, so I cut and pasted a few strings from it, only to find it was ALL stolen from an educational site on the web about SEO strategy. Oops. I naturally told the client, so they won’t be getting any work, anytime soon. For designers, SEO experts and anyone in a vaguely creative industry, you have to have original ideas. It’s the only barrier to entry we have in our imperfect worldwide market, where everyone has access to perfect information. My business partner Mich Slack wrote a piece about this in response to the Glasgow Commonwealth games identity, which you can read here. But at least in that case, the designer had made some effort to change the overall look and feel. It’s hard enough to retain credibility in this industry when your peers will undercut you for the price of a beer, but the sooner these people are kindly asked to leave it, or forced out by more discerning clients, the better. Long live original thought, long live original design and long live clients who can tell the difference. Ok Go video for ‘This Too Shall Pass’ as good as their ‘Treadmills’ video? In my opinion, it’s not quite as ground breaking as ‘Treadmills’ was when it first launched back in 2006, but it’s still brilliant. It is one of those brilliant firsts that has been copied by many but so far not equalled by anyone in terms of originality. But you can see their new one here for ‘This too shall pass’. The production is just brilliant and great fun, like a giant game of Mousetrap on acid. I don’t know much about the brand of the band Ok Go, but i do love their video work and i’m now off to get a listen to some of their other music. If it’s half as coool as their videos, I think i’ll be a new fan. Not much more to say really, other than the fact that I saw it on my Mate Tim Garratt’s blog and loved it so much I had to share it even further. If you want to see how he did it, have a look here. I don’t want this article to be particularly political, but want to review the presentation By David Cameron of the Conservative party from a branding and advertising perspective. Branding is about getting your message across clearly, consistently and most importantly, honestly. It’s an expression I use quite a lot, but the more you advertise a bad product, the faster it will fail. Now we are seeing much more of David Cameron and his policies, it seems that voters don’t quite like what they are seeing. David Cameron had a very privileged upbringing, there’s no doubt about that and in theory that shouldn’t stop him from understanding the public. It’s his pretence of being ‘down there with the kids’ and struggling like the rest of us that is positioning him as something he isn’t and may be the reason that he has thrown away a huge lead in the polls. The recent poster campaign for the Tories, presented a picture of David Cameron that was so far removed from the true picture, that it was ridiculed from day one. It was all things airbrushing, that at first, I thought it had to be a spoof. Here’s the ‘original’, showing a ludicrously airbrushed image of him. He is just presented as too perfect to be ‘one of the people’ quite why he needs the treatment of a Vogue model (albeit done very badly) is beyond me and prompted a response from one of my design peers with a brilliant open forum for people to be able to design their own version of the poster. I just love this particular one, which is so clunkily comped that it makes a mockery of the ‘original’ image and the message of truth and honesty that it was trying to portray. If the Tories go on to throw away their lead in the final vote and we end up with a hung Parliament or a Labour victory, this poster campaign will have to take some part of the blame. In the same way, in 1979, the very famous ‘Labour isn’t working’ poster was credited with having a huge part in winning the General Election for the Tories. Who says advertising doesn’t have an impact?